A driver's license/licence or driving licence is an official document which states that a person may operate a vehicle, such as a motorcycle, car, truck, or a bus, on a public roadway. The laws relating to the licensing of drivers vary between jurisdictions. In some jurisdictions, a license is issued after the recipient has passed a driving test, while in others, a person acquires a license before beginning to drive. Different categories of license often exist for different types of motor vehicles, particularly large trucks and passenger vehicles. The difficulty of the driving test varies considerably between jurisdictions, as do factors such as age and the required level of practice. The first license to drive a motor vehicle was issued to the inventor of the modern automobile, Karl Benz, in 1888. Because the noise and smell of his Motorwagen resulted in complaints by the citizens of Mannheim, Benz requested and received written permission by the Grand Ducal authorities to operate his car on public roads. Up until the start of the 20th century, European authorities issued licenses to drive motor vehicles similarly ad hoc, if at all. The first locality to require a mandatory license and testing was Prussia, on September 29, 1903. The Dampfkesselüberwachungsverein ("steam boiler supervision association") was charged with conducting the tests, which were mainly concerned with the driver's mechanical aptitude. In 1910, the German imperial government mandated the licensing of drivers on a national scale, establishing a system of tests and driver's education requirements that would serve as a model for the licensing laws of other countries. Other countries in Europe also introduced driving tests during the twentieth century, the last of them being Belgium where, until 1977, it was possible to purchase and hold a license without having to undergo a driving test. Because a large number of countries, including Australia, New Zealand, Canada, the United Kingdom, and the United States have no national identification cards and because of the widespread use of cars, driver's licenses are often used as a de facto standard form of identification. Most identification cards and driver's license cards are credit card size—the "ID-1" size and shape defined in ISO/IEC 7810. Many European countries require drivers to produce their licence on demand when driving. In such countries, the driver must always carry their licence on them when driving. In the United Kingdom, it is not necessary for drivers to carry their licence while driving. However, if stopped, a driver may be required to produce their licence at a nominated police station within seven days. The police issue a form for this purpose. Some European countries require adults to carry identification at all times, although a driving licence is not necessarily a valid identification document in every European country. In Spain and Sweden, the driver's licence number is the same as the citizen's ID number. In Poland, a special vehicle registration card and proof of obligatory insurance is also a driving requirement.You must be 18 to get the driving licence. In Japan, a driving license is widely used as identification. In the United States and Canada, driver's licenses are issued by the states or provinces, respectively, and do not look the same nationwide. They are also used as a de facto identification document. For persons not fit, not eligible, or due to personal reasons refuse to operate a motor vehicle, state (United States) or provincial (Canada) agencies – usually the same as the issuer of driver licenses – will issue an identification card with similar attributes to a driver's license. Identification cards do not enable a person to operate a motor vehicle, a fact typically noted on the ID via the phrase 'Not a driver's license' or similar wording. The number of a driving licence issued by the Dominican Republic has the same number as the holder's Dominican Republic ID card. 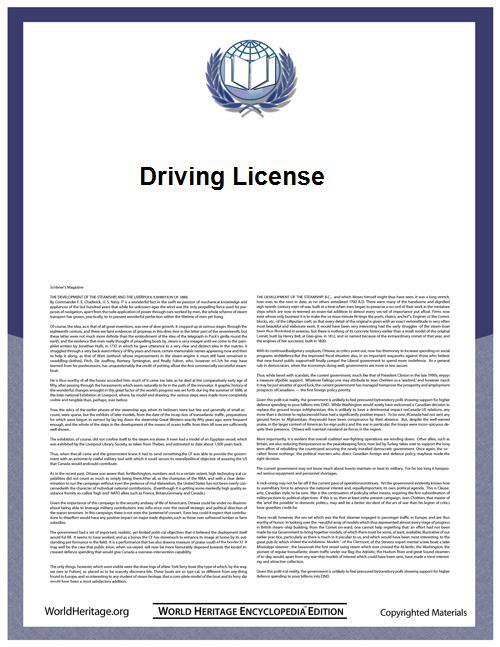 In a number of countries (including the United States, New Zealand, and some provinces of Canada) people who drive commercially are required to have special licenses. The cost of taking the series of tests and examinations to obtain these licenses usually means that an employer would subsidize his or her drivers. The minimum driving age in South Africa is 18, except for small motorcycles which may be driven from the age of 16. To obtain a license, applicants must pass a written or computer-based test to obtain a learner's license, and then pass a road test to obtain the driving license. In India, being a state matter, each Indian state has a "Regional Transport Authority or "RTOs" (Regional Transport Offices) that issues licences. Minimum age is 18 years for all vehicles, however motor cycle having engine capacity below 50 cc may be driven at age of 16. In India, people aged more than 50 years have to undergo strict medical tests in order to obtain a license. The license validity is five years and requires renewal every five years. In India, a commercial driving license is valid for 3 years and requires to renewed. The minimum age for eligibility for learner's permit is 18 years ; as the driver's information is saved against the Computerized National ID Card number which is issued at the age of 18. The License Issuing Authorities vary to each district and work under the relative District Police. New credit card format driving licence has been introduced. The licence bears the digital photo, signature and blood group information of card holder. The record of violation is stored automatically in the database. To obtain a driving licence one must register for the learner's permit at any of the local District Police's designated licence offices and after 42 days can apply for test for a regular full licence. The test phase consists of a theory based test followed by a short practical test. Only the ones who pass the theory test are allowed to take the practical test. The whole test stage is a single day process where both the tests are to be taken the same day. The driving licence currently issued holds basic information of the Driver including Name, Father's Name, Date of birth, Address, Authorized Vehicle Types, Emergency Contact, Blood Group, Fingerprint Impression, Driver Photo. The licence also has a magnetic strip though its viability is yet to be made public. The European Union has adopted a common format for driving licences, and a common set of driving licence categories. They were introduced to replace the 110 different plastic and paper driving licences. The common format with the same information in the same place on all licences allows the driving licence to be understood, even if it is in a different language. The minimum age for getting a driver's licence in Iceland is 17 for a B class licence, a B class licence will qualify a person to drive low powered motorcycles (50cc two stroke or equvaliant, for more powerful bikes one will have to obtain an A class licence), Tractors, ATVs and Automobiles that do not exceed a GVWR of 3.500 kg or 8 passengers. The minimum age in Iceland to get a C1 class (vehicles up to 7.500 kg GVWR) is 18, for a C class (vehicles exceeding 7.500 kg) one will have to have obtained a 12point licence (obtainable without getting a ticket for a whole year) and have reached the age of 20yrs. The minimum age in Iceland for a D class (and DE clas) licence is 22yrs old, the same rules apply as with a C/CE class licence. The minimum driving age in the United Kingdom is 16 for mopeds under 50 cc, and 17 for cars and motorcycles. Access to motorcycles producing more than 25 kW (34 hp) is restricted to riders with two years experience or aged 21. The British Overseas Territories and the British Crown dependencies issue their own driving licences. There is no legal requirement to carry a driving licence in the UK whilst driving, although it must be produced at a police station within seven days, if required to do so by a police officer. In the United Kingdom, one must hold a Passenger Carrying Vehicle (PCV) license to drive a vehicle with more than eight passenger seats for hire or reward, or a Large Goods Vehicle (LGV) license to drive a vehicle with a Gross Vehicle Weight (Maximum Authorized Mass) in excess of 3,500 kg. Special licenses are required in order to transport hazardous materials. The age to obtain a driver's licence in Canada varies by province, as do the necessary procedures. The minimum age for obtaining a driver's licence to drive unaccompanied in most provinces is 16. In Barbados, a person 16 years or over can apply for a Learner's Permit which allows them to drive for a specified period with an accompanying tutor. During that period they will be tested on their driving skill and their knowledge of road signs and traffic laws. On passing both the written and driving test the licence is issued. Once issued a driver's licence is valid for a period of one to five years depending on which period of time the driver chooses to pay for. On the expiry of the period for which the licence is issued, it will become renewable on the last day of the driver's birth month and will again be valid for the time period for which payment is made. Visitors and non-nationals who are the holders of a valid driver's licence issued in their country of residence or origin are not allowed to drive automatically in Barbados but must go to a police station to have a temporary local driver's licence issued. The licence is issued on payment of a fee and the production of the visitor's existing licence. One needs a minimum of 15 years to receive a drivers's license (a juvenile license). To get a new license, one needs to pass a vision test, a written test, and a driving test. These tests are given at acrredited driving schools. Foreigners with a license from another country can obtain an El Salvador license if they have residency. They will also have to pass a vision test. The driver's licence number is the same as the person's Tax ID number. Driving licences in Mexico are regulated by each state, and they all have different rules and requirements. However, all state driving licences are recognised across Mexico, and international licences with an IDP are also recognised as well. A driver is allowed a learner's permit at the age of 15 (in some states), with the cost of approximately 100 dollars, a duration of a year, and requiring to drive with an adult at all times. At the age of 16, the fee drops to 30 dollars, and a driving permit is issued with some usage restrictions, depending on the state (like a curfew). When a driver turns 18, he or she is allowed a full licence. The eligible age varies substantially by state. Nationally by age 16 one can obtain a license after passing the requisite tests and drive without adult supervision. Since the driver's license is a commonplace document that carries much of the necessary information needed for identification, it has become the primary method of identification in the United States. In the United States, a holder of a Driver License is typically legally allowed to operate a motor vehicle up to 26,001 pounds, is not carrying hazardous materials or more than 16 passengers (driver included). Most jurisdictions when granting driver licenses only permit the holder to operate a road worthy four or more wheeled vehicle. To operate a two-wheel motorized vehicle with a sustainable speed greater than 30 miles per hour requires an endorsement upon the license, typically after successful completion of a theory and practical test. The minimum age to obtain a Learner Licence is now 16 in New Zealand, formerly 15. Cook Islands driving licences are issued at police headquarters on Rarotonga, on production of a valid licence from the visitor's home country. To use a scooter or motor cycle (the main hire vehicles for tourists) a short test has to be taken by anyone whose home licence is only valid for cars, in which a police officer observes the applicant riding up and down the main street of the capital. In the United States, this is governed by the Uniform Anatomical Gift Act. In New Zealand and Republic of Ireland, willingness to donate organs for transplantion is also listed on driver's licenses. In Australia, the system of notating organ donation requests on licenses was replaced in July 2005 with a national registration system and the issue of special cards. Temporary visitors from the United States to France (less than 90 days) are permitted to drive with a valid U.S. state driver's license. In addition to holding a U.S. driver's license, visitors are advised (but not required) to carry an International Driving permit, or attach a French translation to their U.S. state driver's license. Many countries have established a driver's license exchange arrangement after reviews of the foreign jurisdiction's licensing processes. Where standards in the other jurisdiction are comparable in areas such as medical standards, minimum driving age, and knowledge and road testing, an exchange (or honoring) of the foreign jurisdiction's license may occur. This may also be called Driver’s License Reciprocity. Most license-issuing authorities require holders of foreign licenses taking up residence in their jurisdiction to obtain a local driver's license within a limited time (typically 6 months or 1 year). In most cases, the driver must follow the full local procedure for obtaining a license, but some jurisdictions have mutual recognition agreements and will exchange the foreign license for a local one without the need to undertake an additional driving test. U.S. state driver's licenses can be exchanged from the 15 states below during the first year of legal residence in France: Arkansas, Colorado, Connecticut, Delaware, Florida, Illinois, Iowa, Maryland, New Hampshire, Ohio, Pennsylvania, South Carolina, Texas, Virginia and Wisconsin. If you are a resident of France (holder of a carte de séjour or carte de residence), you may drive in France with a valid U.S. state driver's license for a one-year recognition period, beginning on the date of validity of the first carte de séjour (exception for students who are allowed to use their driver's license for the duration of their studies). In addition to having your U.S. state driver's license, residents are also required to attach a French translation done by a sworn translator (expert traducteur or traducteur assermenté). The U.S. Embassy, supported by the American Chamber of Commerce in Germany, continues to actively press all U.S. states to reach an agreement on the reciprocal recognition of driver's licenses with Germany, essentially a waiver of testing requirements. The person has held a full driving licence (not an International Driving Permit) for three years issued by one of the following countries or territories: Australia, Austria, Bangladesh, Belgium, Bermuda, Canada, China, Denmark, Finland, France, Germany, Guernsey, Iceland, India, Ireland, the Isle of Man, Israel, Italy, Japan, Jersey, Luxembourg, Macao, Malaysia, the Netherlands, New Zealand, Nigeria, Norway, Pakistan, Portugal, Singapore, Spain, Sweden, Switzerland, South Africa, South Korea, Namibia, Taiwan, the United Kingdom and the United States. Hold a passport or an equivalent travel document of the country or territory in which the licence was issued. A foreigner above 18 years of age and holding a Work Pass/Dependent Pass/Student Pass may drive in Singapore with a valid class 3, 3A or 2B foreign licence, for a period of not more than 12 months. A Singaporean driving licence is required after 12 months. Those on short term social visit may drive with their foreign licence for up to 12 months each time they enter into Singapore. For licences not written in English language, an International Driving Permit or translation is required. Foreign license conversion is only granted for class 2B and class 3 qualified driving licences. Delaware has a reciprocal license exchange for Germany and France. A District of Columbia driver's license may be obtained while maintaining out-of-country driver’s license. D.C. driver's licenses may vary for non-U.S. citizens, depending on visa classification. The written test is required for non-U.S. citizens who possess an out-of-country driver's license. Florida has a reciprocal license agreement with South Korea. Nevada drivers who have never been licensed or those who currently hold a license from a foreign country or a U.S. territory must take vision, knowledge (written) and skills (driving) tests. New York (the state) driver's license may be obtained by a resident of another country. If the driver has a driver license from any nation except Canada, they must pass a written test, complete a 5-hour pre-licensing course and pass a road test to qualify for a driver's license. Washington State has a reciprocal license exchange for Germany, South Korea, and Canada (British Columbia only). Commons has media related to Driver's licenses.